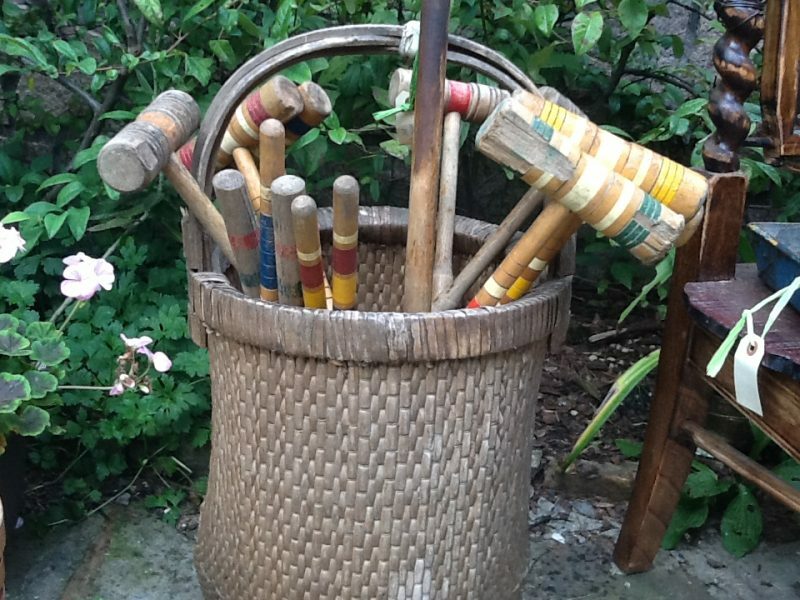 Antique mis-matched croquet set has lots of mallets, balls, and hoops. Chip was in turmoil. He was trying to decide what to wear to Alison’s party. He didn’t want to look too alternative, but he also didn’t want to look to stuffy. It was a tough dilemma. He didn’t know Alison well enough to tell what her vibe was, and he wanted to get to know her better. First impressions were so important. He pulled out some cool tee shirts and lined them up on his bed. There were vintage Jerry Garcia tour shirts, Phish tour shirts, and Widespread Panic tour shirts. Chip rejected all those. He didn’t want to come across as a person still living in the past. Then he looked at his assortment of political shirts: peace symbols on a background of tie-dye, Obama shirts, and a cool shirt he had gotten at a Veteran’s for Peace “Empty Boots” event. He rejected those as well. Superman tee shirt? No. Maybe wearing a tee shirt was goofy. It might make him appear to be a kid. Alison was a teacher, a grown-up, and might not be interested in a guy in a Grateful Dead shirt. He opened his small closet and went through his good stuff. His father had been collecting Hawaiian Aloha shirts forever and had given him some when he was thinning his stash. His eye was stopped by a colorful shirt with large red and orange hibiscus blossoms on it. Yes! That would look great. He pulled it out and put it on untucked over his only clean pair of jeans. He was ready. With butterflies in his stomach, he hopped on his bike and headed to Alison’s house across town. As he peddled up North Fork Road, he could hear the party before he could smell the bon-fire. It was a blend of voices in conversation, laughter, and unidentifiable strains of music. This was it. His bike bounced over the ruts in the unpaved driveway leading down to the house. Sunny enjoyed her work volunteering at the Montessori school, but she remembered the days when it was easier to get up from one of the tiny chairs or worse yet, the floor. Now her knees creaked as she went up or down, but it was important to get down on the children’s level when dealing with them. “No,” he had responded. “Unique is my sister’s name.” And indeed she was as unique as her name. Sunny enjoyed seeing the clothing that Unique chose to wear to school each day. She always wore a vintage hat and carried a vintage purse. The layers of clothing she wore were a riot of color and texture. Sunny wished she could find clothes just like those, as she too enjoyed color and texture. Unique said her momma found her clothes at various consignment shops and thrift stores. Sunny too went to such stores, but all she found were polyester moo-moos that smelled of BO. Maybe one day she would get Unique’s mother, Mary Ann, to take her shopping. “So what was so sad about this story?” asked Artemis. “No, her daddy was a farmer, and farmers have to kill animals. It’s part of their job. You know, they kill animals so we can eat hamburgers and stuff,” said Felix. Felix fell on his folded arms, crossed on the tiny work table, and sobbed his heart out. Artemis and Unique giggled behind their hands until Sunny told them to behave. She patted poor Felix on the back and congratulated him for having a soft heart. She would have to watch for the next production by Asheville Creative Arts. If they made so much of an impression on Felix, they must be good.